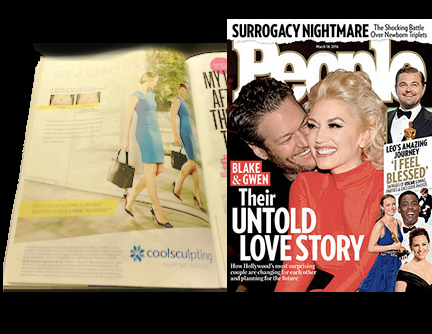 People Magazine Oscar’s Edition hit newsstands all over the country with CoolSculpting’s new See A Slimmer You ad on Friday. Developed by Harvard scientists, CoolSculpting is the only FDA-approved device of its kind that permanently targets and destroys fat cells using Cryolipolysis. It’s a completely noninvasive procedure, and it’s very safe! There are no incisions or needles, and no anesthetic required. A patient can return to his or her daily routine right after treatment with no downtime. Now patients have noninvasive options and don’t have to get surgery or liposuction. The body naturally cleanses itself of the dead fat cells and in 6-12 weeks, you can see a slimmer you. RajaniMD is a top provider for CoolSculpting and has been for 3 years now in Portland, OR. With CoolSculpting being provided by more clinics, it’s important to choose the right one for you. Our certified technicians have completed advanced coursework at CoolSculpting University in California. With safety being a top priority, our technicians will listen to you and create a customized treatment plan to fit your needs. Our treatment rooms are equipped with DualSculpting, flat screens, snacks, Wi-Fi, and immediate staff to make sure you are comfortable at all times. Consultations are always complimentary! Get Cheap Lip Filler- How Much Does It Cost? What is the perfect lip ratio?